This episode of Washington Grown went underground! The crew visited Urban Eden Farm in Spokane to learn about some of the crops they grow underground and how they care for their soil. They also talked with members of our Washington State Soil Health Committee about what farmers are doing in the state to improve soil health. Keep watching until the end, because they make a delicious beet salad at Salare and get a unique burger recipe from a viewer as well! Finally, the Washington Grown crew visited 2nd Harvest to learn how they are bringing food security to the area as well as helping clients learn how to prepare healthy food. The part of the episode featuring the Washington State Soil Health Committee was shot on October 3rd, 2018. It was filmed on Dale Gies’ potato farm outside of Moses Lake, WA. Dale plants mustard before planting potatoes as a way to control nematodes instead of using commercial fumigants. Here’s some behind-the-scenes footage from the day of filming. Follow the link for the House Bill Report HJM 4014. NOW, THEREFORE, Your Memorialists respectfully affirm their support for the research efforts of the United States Forest Service, the Agricultural Research Service of the United States Department of Agriculture, the Washington State University, the Washington State Department of Ecology, and other institutions to produce biochar from the removal of wildfire fuel loads from the forest floor, waste agricultural products, and other waste biomass destined for landfills or combustion; and support the research of biochar as an animal feed, remediation tool, landscaping material, and soil amendment for forest and agricultural lands. 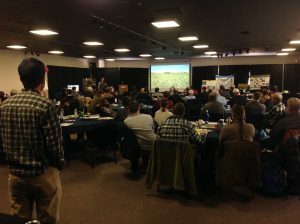 The first annual Palouse Alternative Cropping Symposium was held on Friday, February 23rd in Pullman, WA. The event was a great success with 80 people in attendance and six fantastic presentations from local growers who are experimenting with cover crops and cover cropping and grazing. In addition to the presentations the program included an interactive poll that addressed where growers get most of their information, soil health on the farm and what barriers exist for trying cover cropping. 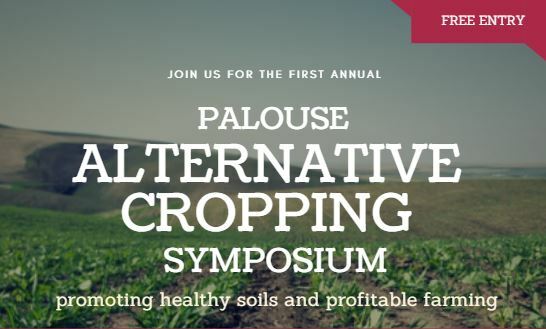 This event was the first of three Alternative Cropping Symposiums that will be facilitated by the Palouse Conservation District over the next couple of years. 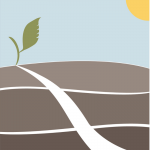 The goal of the symposium is to connect growers in the region that are experimenting with cover crops and to provide a forum for peer to peer education. This event was made possible by a grant through the Washington State Soil Health Committee and through donations from our generous sponsors. Sponsors for the symposium included: Pacific Northwest Farmers Cooperative, Palouse Conservation District, OTT Hydromet, Northwest Farm Cred Services, Viterra, Spectrum Crop Development, Clearwater Seed, Spokane Community College, Pearson Farm and Fence, Spray Center Electronics, Roots of Resilience, and Rainier Seeds. If you are interested in participating in the symposium next year or you wouldlike more information about the event visit www.palousecd.org or contact Ryan Boylan(ryanb@palousecd.org) or Lovina Englund (lovina@palousecd.org). For more information on this grant project, click here.